During the last couple of weeks the banter between a brand owner for Tea and the Tea Exporters Association was very interesting. Ultimately the editor of the said newspaper mentioned that no more correspondence would be entertained and closed the debate. In my view the answer lies in the statistics and how strategy can be development based on data. To be honest there was logic on both sides of the arguments presented in the last three weeks. The key debate is on the basics of business - segmentation, targeting and positioning- and as a strategy are we going to differentiate or niche market the brand or category. If we analyse the data for the last 50 years we see that Sri Lanka’s performance in the basics of business segmentation and targeting has been very poor. As per the table below we see that every 15 years the top 10 export markets keep changing which means that Sri Lanka’s equity in the market for ‘Ceylon Tea’ does not gain traction. In 1960 it was the UK, Australia, the US, Iraq, South Africa, Canada and New Zealand. In 1985 (15 years after), Egypt, Syria, Saudi Arabia and Russia came into the key export markets which meant a new set of customers. Just six years after Azerbaijan and China is in the top 10 markets but the good news is that the top five markets have been stable, which is good news for Sri Lanka. Let’s analyse what is happening in the top market, Russia, which has held ground as the number one market for our tea. Apart from the Russian Federation being the key market for Sri Lanka, it is also the number one market globally for importing tea, with a 175 million kilograms per annum performance. If we dive deep into the dynamics of this market data, the bulk of tea exports out of Sri Lanka have increased from 21,166 in 2000 to 28,743 metric tonnes as at end 2009. On the other hand, packeted tea volumes have come down from 18,377 to 7516 metric tons during the same period. The reason for the shift was that Russia duty on bulk exports had been reduced to 0% and thereby the Russian policymakers were to give space for organisations to set up in Russia to pack teas that are imported from many countries for blending purposes and thereby spruce up FDIs into the country. The Russian policymakers also introduced a labelling law to allow tea products to carry the tag ‘Ceylon Tea’ even if it contains only 51% of tea from Sri Lanka whilst the rest can be blends from other countries. This can be seen with facts, as less expensive teas imported into Russia from countries such as Kenya had increased from 5,123 MT to 11,821 MT from 2002 to 2009 whilst imports from Vietnam had catapulted from 4,720 MT to 13,183 MT. If we want to further validate these numbers, packeted tea exports from Sri Lanka came down from 18,377 to 7,516 MT between 2000 and 2009. If we carefully examine the private sector numbers we see that the top six exporters’ numbers have come down from 15,623 MT in 2002 to 9,346 MT by 2009, which is a decline of almost 40%. What this means is that the consumer in Russia wants a value for money tea whilst also wanting a Ceylon Tea product, which means that unless Sri Lanka understands this reality and adjusts to this reality we will lose volume, customers and traction in this market, just what has been happening for the last 50 years. Going back to the theory segmentation, targeting will be the decision to take. In the area of ‘targeting’ do we set up blending facilities in Sri Lanka or allow the blending to be done in Russia as seen above given the changing customer behaviour? In other words a tea hub concept in Sri Lanka or not. If we take a global case in point on the importance of having to change to the customer requirements the best case in point is Kodak, which is a top-of-the-mind brand synonymous with the category for decades. With a turnover of almost $ 14 billion and brand value estimated at $ 1 billion, it was one of the strongest companies globally. However, the company refused to change the values chain based on the changing consumer who wanted convenience. It refused to understand the changing consumer requirements where consumers wanted convenience and there was a convergence of the camera and a mobile phone where images were captured electronically and shared online. Today, the brand has crashed to a loss of $ 0.3 billion for the last five years and sales revenue has plummeted to less than $ 0.1 billion that finally led to the company having to file for bunbkruptcy under Chapter 11. It is a classic case to the world of an organisation which did not want to change the value chain based on the changing consumer requirement. French wine and Colombian coffee: Whilst segmentation and targeting are the basics of business, ‘positioning’ is now emerging as the only competitive edge in today’s world. On this front we see another perspective where strong marketing is conducted by France to maintain its premier positioning supported by the high quality image which has successfully fought cheaper wines. If Ceylon tea does not want to take the ‘tea hub’ option of blending, the French wine strategy can be pursued to drive up the position of ‘Ceylon Tea’ single origin tea linked to brand manufacturers. But sadly Rs. 5 billion has been in the bank account with the global campaign not taking off just like Sri Lanka’s tourism destination marketing campaign, which is sad for Sri Lanka. Policymakers: from the above data, we see that policymakers can solve the issue without creating conflicts in the private sector space. From a demand side if the ‘positioning’ route can be taken then it must drive aggressively and follow the French wine strategy or the Colombian coffee success story. The aggressive policy intervention can solve the demand side issue in Russia and it must also aggressively take a call on the supply chain to avoid the tea industry going through the Kodak saga. On the supply side, research reveals that from the total extent of Old Seedling Tea (OST) in Sri Lanka, 75% of it belongs to the corporate tea sector. On this front almost 90% of the tea stock is above 60 years of age which means that senility of the tea bushes is a foregone conclusion. This is the key reason for the declining productivity and production in this segment over the last couple of years. Around six years back the corporate tea sector was generating almost 148 kg million of tea but this number has fallen to approximately 126 kg million. The Tea Research Institute estimates that the volumes from the corporate sector will decline to 98 kg million of tea within the next five years. If one computes the loss to the country in volume terms it will be 28 kg million of tea per annum and in value it can be as high as Rs. 10 billion, which captures the supply end saga that the tea industry is up against. One can argue that the RPCs must embark on a rapid replanting program but if the cost of replanting a hectare acre of land is over Rs. 3 million and as at now given that most of the organisations are under pressure for profits, this option is only an academic discussion. 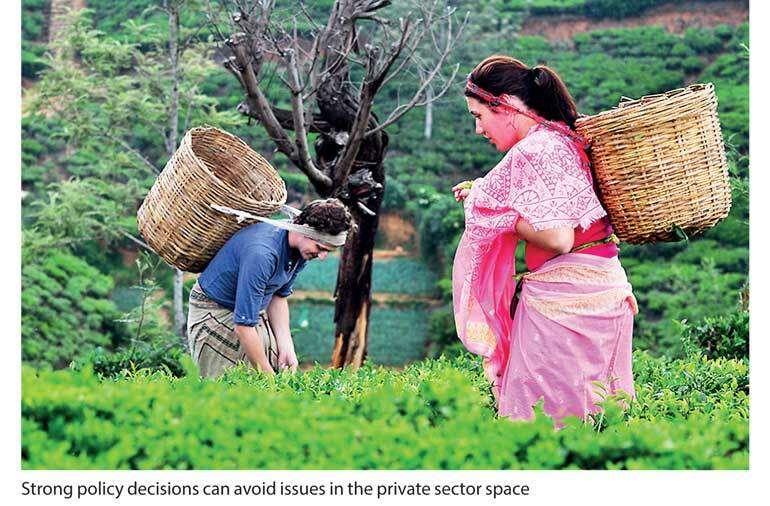 Hence policymakers must fight and direct the CESS collected to a replanting program rather than directing promotional funds towards this purpose, which tells us the importance of the policy direction to the total tea industry (demand and supply) side. Given the challenges we have from the demand side of the business and from the supply chain side of the business, from the above data we see that we are facing a Catch-22 situation. Hence unless we develop a new business model, it will be absolutely realistic to say that Ceylon Tea is going the Kodak route. In fact a senior planter, who is a CEO of a top Regional Plantation Company, has openly stated that “now we are in a lunatic mode as doing the same thing expecting different results is lunacy.” Whist is required now is not banter in the media but action on the ground. If we track back the success of the apparel industry, in the early ’80s Sri Lanka was termed mere contract manufacturers and some even used to refer to the industry as tailors, but thereafter with some strategic thinking by the industry, Sri Lanka grew into a global hub for ethically-manufactured clothing. This has given teeth to the industry in competing with price-savvy merchandise coming in from Cambodia, China and Bangladesh and today this noble industry is targeting $ 5 billion plus in export revenue by making Sri Lanka an apparel hub in Asia for R&D and technology sharing for fast fashion. We see a similar trend in the tea industry, where with strong leadership the plantation industry was nationalised in the 1970s when it came under Government control; it went on in the 1980s to make a bold decision to make the Colombo Auction control the global demand chain by breaking away from the great London Auction system, which has held ground for many years. The Colombo Stock Exchange, commanding the highest values for tea globally, offers testimony that this decision was correct. Then in the 1990s the supply chain was privatised, which gave the opportunity for new thinking to be introduced to the industry with strong R&D power and capital infusion that resulted in Sri Lanka becoming the best performing country globally for value addition tea at a commanding 43%. The above argument explains that the Sri Lankan tea industry has the skill and focus but what is required is strong policy and robust implementation. With a 25% implementation of Budget proposals in 2017 and the commitment by the Minister if Finance to move this up, all ministries now must change the tide at least in the next half of the current Government.